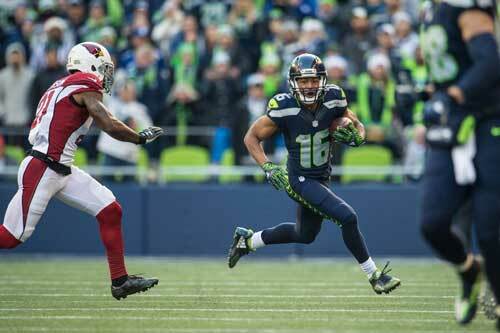 Tyler Lockett Wants You to Live Life Without OW! As an NFL player, I know firsthand — and first tibia and fibula — that injuries can happen to anyone. When it comes to recovery, RICE is an easy way to remember how to treat minor injuries. “R” stands for Rest. When you get injured, the first thing to do is stop the activity that is causing pain. Resting gives your body time to recover. “I” is for Ice. Applying an ice or cold pack will prevent or reduce swelling. Apply for 10 to 20 minutes, three or more times a day. “C” means Compression. Wrapping the injured or sore area with an elastic bandage is another way to reduce swelling. But remember, don’t wrap it too tight or you could cause swelling below the bandage. “E” stands for Elevation. Elevate the injured area while applying ice or when you are sitting or lying down. Try to keep the injury at or above the level of your heart to reduce swelling. Remember that RICE is only for minor injuries that you can treat yourself at home. For more serious injuries, talk with your doctor or call 9-1-1 if it’s life threatening.